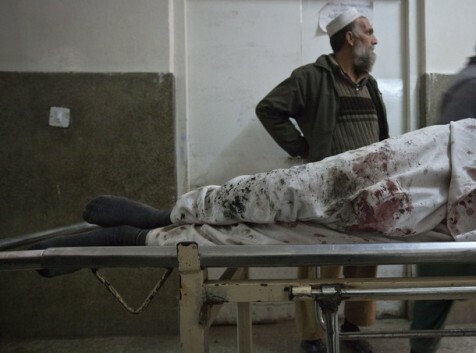 December 26, 2010 (KATAKAMI / VOA) — U.S. President Barack Obama has condemned a suicide attack against members of an anti-Taliban tribe in northwestern Pakistan. 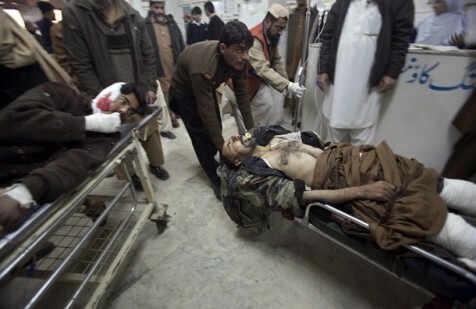 The Saturday attack in Pakistan’s Bajur district killed at least 45 people and wounded more than 100 others. Children were among the victims. 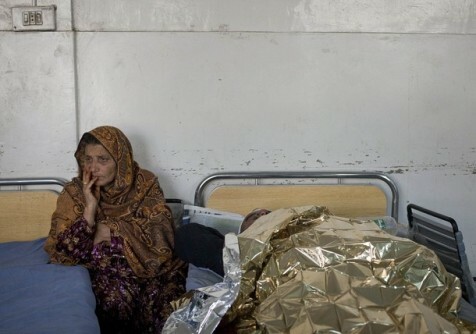 Injured victims of suicide bombing are treated at a local hospital in Khar, the main town of Pakistan’s Bajur tribal region along Afghan border, Saturday, Dec. 25, 2010. A female suicide bomber detonated her explosives-laden vest killing scores of people at an aid distribution center in northwestern Pakistan while army helicopter gunships and artillery killed a similar number of Islamic militants in neighboring tribal regions near the Afghan border, officials said. As reported by VOA, Authorities in northwestern Pakistan say a suspected suicide blast has killed at least 43 people and wounded scores. 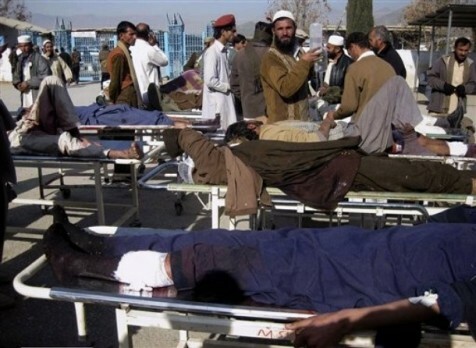 The attack comes a day after Taliban insurgents launched coordinated assaults on security forces in a neighboring district that left 11 soldiers and 24 militants dead. Ayaz Gul has the details from Islamabad. 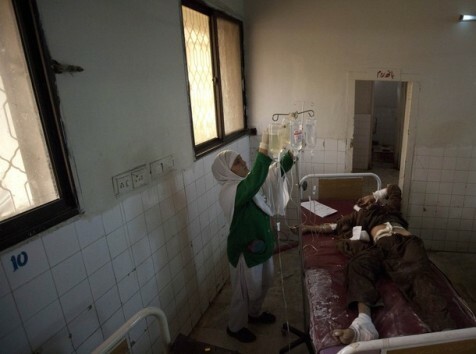 The suicide bombing occurred in the town of Khar, the administrative center of Pakistan’s insurgency-hit Bajaur district on the Afghan border. December 25, 2010. MARJAH, Afghanistan (KATAKAMI / AIR FORCE TIMES.COM) — The top U.S. and NATO commander in Afghanistan crisscrossed the country on Saturday, visiting coalition troops on Christmas at some of the main battle fronts in a show of appreciation and support in the tenth year of the war against the Taliban. Gen. David Petraeus started his Christmas visit by traveling in a C-130 cargo plane from the capital, Kabul, to the northern province of Kunduz, telling troops with the U.S. Army’s 1-87, 10th Mountain Division that on this day, there was “no place that (he) would rather be than here” where the “focus of our effort” was. The northern part of the country has seen increased fighting, with the Taliban stepping up their attacks as NATO focuses its sights on the militant movement’s southern strongholds. 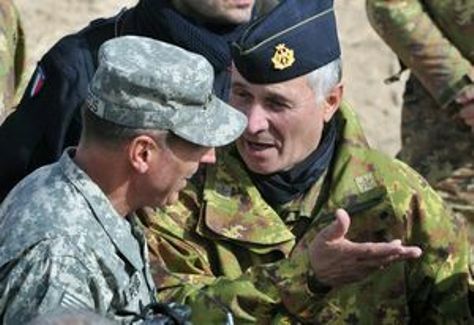 Petraeus was briefed on the situation in the region by German Maj. Gen. Hans-Werner Fritz, the commander of NATO’s northern regional command. Petraeus handed out commemorative coins to troops who had served for 3 or more years since the Sept. 11, 2001 attacks, and awarded several medals, including three purple hearts. He then went by helicopter over desert mountain peaks to the western province of Farah, where the Italian army’s 7th Alpini is stationed. Petraeus’s next stop was the Taliban stronghold of Marjah in Helmand province, scene of some of the heaviest fighting recently between the Taliban and NATO-Afghan forces. He spoke to the Marines on the base, praising them for the improvements in the area, which was once a Taliban stronghold and still sees Taliban attacks. If the situation Marjah had been the same as earlier in the year, Petraeus said, that unanimity would not have been there. Marjah has become a symbol of the problems facing NATO troops in Afghanistan. More than 7,000 U.S.-led NATO ground troops launched a nighttime invasion of the region of farming hamlets last February to rout insurgents and cut off their income from the drug trade. NATO officials said the effort would pave the way for the Afghan government to move in aid and start delivering public services. Marine Maj. Gen. Richard Mills on Dec. 7 declared that the battle in Marjah was “essentially over.” But the campaign took longer than NATO officials had hoped, and illustrated the complexity of trying to wrest control of an area where Taliban influence remained strong. 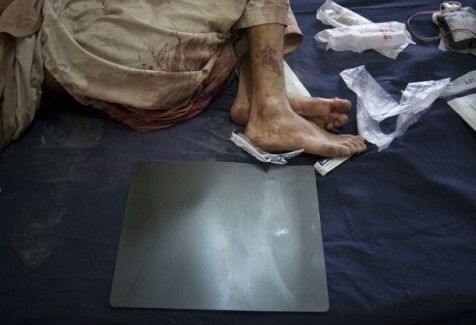 Efforts to create a civilian government in Marjah have been painfully slow, and U.S. troops struggled against roadside bombs and sniper attacks from an enemy that could blend in with the local population. He said that when the campaign in Marjah began, it was “a headquarters for the Taliban,” a bomb-making center and location for the illegal narcotics industry. “Now of course it is flourishing,” he said. Where once there was no school, there are now 1,200 attending classes. 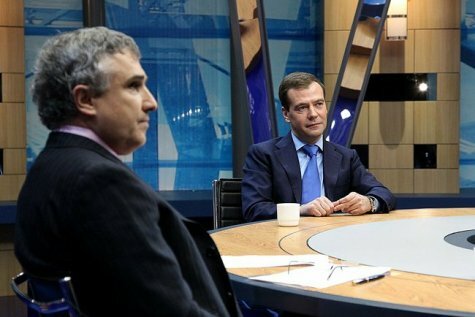 Dmitry Medvedev spoke live with the heads of three federal TV channels: Konstantin Ernst of Channel One, Oleg Dobrodeyev of Rossiya, and Vladimir Kulistikov of NTV. 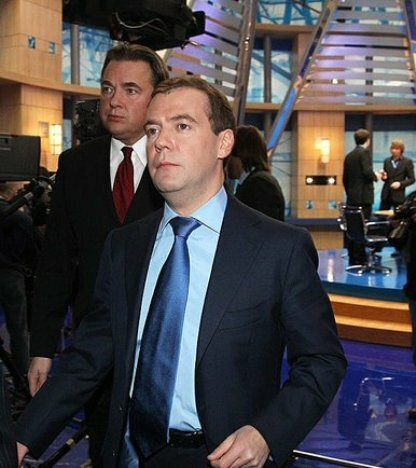 December 24, 2010 (KATAKAMI / KREMLIN.RU) — Dmitry Medvedev spoke live with the heads of three federal TV channels: Konstantin Ernst of Channel One, Oleg Dobrodeyev of Rossiya, and Vladimir Kulistikov of NTV. GENERAL DIRECTOR OF CHANNEL ONE KONSTANTIN ERNST: Good afternoon, viewers. Today, like a year ago, we have this opportunity to look back over the year together with President of the Russian Federation Dmitry Medvedev in this conversation broadcast live on three federal channels. PRESIDENT OF RUSSIA DMITRY MEDVEDEV: Good afternoon. KONSTANTIN ERNST: Mr President, looking back over the outgoing year, each of us has particular images that will remain etched in our memories for good. What are your main images of 2010? DMITRY MEDVEDEV: I think this is a good comparison. I would name five images, though this is not an exclusive list of course. First, there is the recovery from the global economic crisis, a more drawn out event in nature, but very important for all of us. This year, instead of falling we grew and developed. Yes, there are still difficulties, problems and shortcomings, but we achieved fairly stable growth this year and are close to a GDP growth rate of four percent. What’s more, this is not just standard economic growth, but reflects too our economy’s increasing modernisation, and thus the increasing modernisation taking place in our lives too. Another very important event is that we began taking a new attitude towards children’s issues and our country’s demographic development. I deliberately made this the main theme of my [Annual] Address [to the Federal Assembly] and proposed a series of measures. Are these measures sufficient? I think not, but we will continue our efforts to develop them and improve our institutions. Whatever the situation, this is a core link in our social development, and without the right policy towards our children we simply will not have a future. The third big image that will remain with me is the weather problems we had, the fires and the heatwave that our country suffered this last summer. This was a very difficult time both psychologically and physically, and it affected our economy too, slightly lowering our growth rate and creating problems with some foodstuffs. This was definitely a very serious event, all the more so as people lost their lives. Another subject that I think is extremely important is security. By security we mean not just our country’s internal security but security all around the globe. This year was marked by a very big event. We and the Americans successfully concluded a very important new arms treaty – the New START Treaty. This document will form the cornerstone of security over the coming decades in Europe and around the world, and I am very pleased that we are now moving towards ratifying it. I must mention the 65th anniversary of Victory too. This is unquestionably a very special date for us, a date that shapes our identity as Russian citizens and that makes us modern individuals, but does not let us forget the memory of the past. I would place these five things among the year’s biggest events and greatest challenges. Of course, others could be named too, and we will talk about them, no doubt. I think, for example, that our efforts to improve the law enforcement system, fight crime and improve the laws on the law enforcement agencies’ work are also very important. GENERAL DIRECTOR OF NTV TELEVISION COMPANY VLADIMIR KULISTIKOV: Talking about the New START Treaty, Mr President, when Carter and Clinton were in office there was a phrase in O. Henry’s Cabbages and Kings that I particularly liked: to add to all the other misfortunes, there was a Democrat president in the United States that year. Obama is a Democrat, but he is a completely different kind of person, and good on him for getting this important treaty through the Senate. Why did your telephone conversation with him take place so late yesterday? Was he celebrating the ratification? DMITRY MEDVEDEV: No, he simply left to take a break. Our conversation did indeed take place late, after 11 in the evening here, but like anyone else, he has the right to get some rest too. He left to take a break for Christmas, and I think he did so with a feeling of duty done. He did indeed do a good job to get the treaty ratified in not the easiest of circumstances, and as I said to him, this really is important, as it will form the foundation for our security over the coming years. VLADIMIR KULISTIKOV: Mr President, he might have a tougher time in his work next year, as the election defeat in November complicates his situation in many ways. Is there not the danger that your agreements will not be fulfilled and our relations with America will take a turn for the worse? DMITRY MEDVEDEV: I hope this risk is minimal. I realise that there are people in America who see the reset in relations as something positive, and others who can’t bear the thought and think that the Russian Federation is the centre of all evil. Yes, there really are such people there. But what can we do? This is all part and parcel of developed democracy, which brings people with a wide range of different views to power, who then try to lobby these views in the legislative bodies. But I hope that American society and the American establishment have enough tact and perseverance to keep the reset on course. 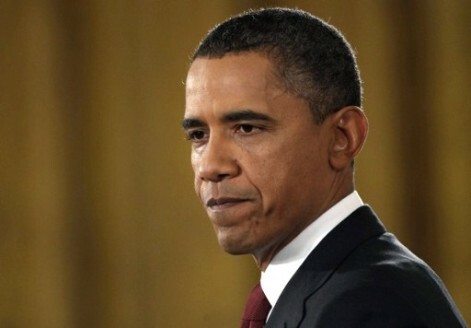 Perhaps President Obama will face increased difficulties, but I am sure that he will be able to cope. KONSTANTIN ERNST: Mr President, when we looked back over 2009 a year ago, we talked about the results of the crisis, the losses it caused, and the exit scenarios, and you said that we need to seize the opportunity to overcome our technological backwardness. The word ‘modernisation’ was probably the most popular term in Russian domestic politics last year. How would you assess the initial results this modernisation has produced for ordinary people, the man in the street? DMITRY MEDVEDEV: I think the results are not bad. I think we have achieved results, though not many yet. I hope we are all pragmatic people, however, and when we set this course, when I wrote my article that you know, we realised that we would not be able to achieve huge success in just a year. But what is important is that modernisation really has become part of the political agenda. There is not just talk but actual work underway now. Laws have been passed, and I thank the State Duma for tackling this work and supporting the president’s course. Government resolutions are coming out in this area too, and business is also showing more interest in innovation overall now. There has not been a radical transformation yet, but business does realise now that if we do not invest in modernising production and developing innovation, if we do not work on the five priorities we set, we will most likely end up technologically backward and with a raw materials-dependent economy. Many assessments have made this point over recent years. So, modernisation is going ahead. It is perhaps moving faster now than at the start of the year, but we still have much to do, of course. As for the results in terms of ordinary life, we are seeing even light bulbs coming onto the market now, modern light bulbs that use less electricity. These are things we need to work on at the everyday level. GENERAL DIRECTOR OF NATIONAL RUSSIAN TELEVISION AND RADIO BROADCASTING COMPANY OLEG DOBRODEYEV: Mr President, you mentioned the main theme of your Presidential Address – children. In this respect there is a big issue that has society very worried – the problem of abandoned children. As we know, there is a drinking problem in many families, with the result that children are abandoned and left to look after themselves. This creates all kinds of dangers, not to mention that some parents use their children as a source of income in these circumstances. In our streets and in our schools they encounter what is probably one of the biggest dangers today – drugs. We are seeing this more and more often here. What can we do about it? DMITRY MEDVEDEV: This really is a serious problem. I spoke about this in part in my Address, but there are indeed some issues that perhaps do not get the direct attention they need or are kept hidden in out-of-sight corners out of a sense of shame. As for abandoned children, yes, we do have a big problem here. Going by the formal numbers, there are fewer children in children’s homes now. The number has gone down by around a third over recent years, including through adoptions. These adoptions are a good thing if carried out in accordance with the law and with the proper follow-up. But at the same time, there are children who have a family only formally, but who suffer in this family, and there are no decent statistics on the numbers of such children. This is why I created the post of children’s ombudsman, and this ombudsman is working actively, looking into the situation in various places. I am certain of this. The most important thing is to diagnose the danger in time, identify the risk to a child’s life and health and take a decision. Decisions can be various. Last year, more than 60,000 parents were deprived of their parental rights. This is something we need to take seriously. A child has only one mother and father, and if the court deprives parents of their parental rights, it essentially deprives the child of these closest people. But at the same time, in some cases this is simply necessary to protect the child’s life and health. This is a big task for the authorities and the public organisations, including NGOs, which I think should be particularly attentive and active in this work. The fact that we have really started to focus on the issues of children, motherhood, and demographics has drawn public attention to them. I see that a lot of people are writing about them now, writing to me in various forms, via the internet too, and you can always see some trends, some particular developments, and perhaps make some adjustments even. A law was signed recently concerning a number of benefits paid to women, maternity and childcare benefits. When the Government drafted this law they acted on the assumption that it would affect only a relatively small number of women. Some would gain, and others would perhaps lose a little. But I received a lot of correspondence from people asking how can this be happening, saying that there we were working on the demographic situation and protecting children, and how could the decision be made to lower these benefits for some people? How would this help to build normal families and encourage people to have children? I therefore want to say here and now that I have decided to come back to this issue and draft amendments that will enable women to set the period that will be used to calculate the benefit themselves. Let it be as they want. This will settle the problems that were raised in this respect. Why am I announcing this here on live national TV, because the authorities need to listen to what our citizens say, and if a decision has been made that creates problems, it is no sin to fix it. This is a normal situation. VLADIMIR KULISTIKOV: Mr President, coming back to the drugs issue, Egor Bychkov in the Urals decided to fight this problem in his hometown of Nizhny Tagil. To the delight of the local drug lords our justice system almost locked him away for several years, but public opinion intervened, and thanks to you too for saying your word. This danger has passed now. He made extensive use of compulsion methods in his work with drug addicts in an attempt to get them to break this destructive habit. Do you think that such methods should be more widely used, all the more so as this practice already exists in developed countries, in the United States, for example? DMITRY MEDVEDEV: I am not a specialist, but I will give my view. First, it is not popular here to talk about the issue of drugs in our schools and universities. One could sometimes get the impression that we have no problem here, but sadly, we do have a problem. Official statistics give a figure of 160,000 schoolchildren who have drug problems. This is a huge number – 160,000! REPLY: Yes, it is a huge number. This is maybe a hangover from the Soviet period, this illusion that “we don’t have drug addicts and everything is fine here.” Perhaps this stereotype still lurks in people’s minds, but sadly, the problem is such now that we really need to beat the alarm. That is the outer aspect of the issue, but as far as treatment goes, I am not a specialist. I know that various methods exist. These methods must be lawful. Force is a bad thing of course and sparks our indignation, but at the same time, it is a question of choice. Ultimately, I think these are decisions that should be taken by the drug addicts themselves, or perhaps by their families, because in some cases there is perhaps no other way of saving a person. The dilemma is straightforward: either death, or perhaps compulsion and cure. Those who criticise such methods should keep this in mind too. OLEG DOBRODEYEV: Perhaps labour therapy would have an effect? We all remember how in the Soviet times people were dreaming about small patches of lands. Your idea to give land to families with three or more children that you stated in your annual address was welcomed. As we know, Russia has millions of acres of abandoned land. Perhaps it would be good to think of a way to bring people back to the land? Find a mechanism to provide land plots for those who want them? DMITRY MEDVEDEV: I think about it all the time. Our country is unique but it so happens that it also has the largest territory. It’s mostly northern-type land but not just that. Generally speaking, Russia, historically, has always been a major agricultural producer. We have 10% of the world’s arable land, and 20% of the fresh water reserves. This is not only huge capital to use in the agrarian business and export, it is also something that we can use to start living a good life. We know how things happened. A huge number of Russians today live in apartments. This was good at its time because it was an improvement on communal apartments. But what we have to do now is disperse evenly around the country. We have to implement the right land policy. Children and encouraging childbirth is just one area of focus. I hope our experience here will be used, we are currently working on the relevant regulations. But in general we have to start thinking about ways to simplify procedures for our people to acquire land plots – land not just for farming purposes, but for building a house and living there too. I think that we have to change our mindset. We can’t stay bunched together. We have to try and provide normal living conditions for people. A lot will depend on how our policy is implemented in Russia’s regions. This is what happens when you come to a big city. It has several satellite towns around it and that’s all. No one lives outside those towns. At the same time, the living conditions in the city itself are often terrible. OLEG DOBRODEYEV: Of course, it’s crowded. DMITRY MEDVEDEV: Crowded and very dirty. The living conditions are terrible and the ecological situation is not very good, to put it mildly. We need to spread out. This is important both in the geopolitical sense and it is important for our future. VLADIMIR KULISTIKOV: Mr President, your words that our political system is showing signs of stagnation has left a great impression on great many people, including me. The fact is that if people ask for land, they simply demand justice, and these demands cannot always be satisfied through official political channels. Especially since you said once that the system is “coasting”. You know, I can just see the faces of some of our politicians, with their Courchevel suntan replaced by a Dubai suntan and then a Sardinian suntan, and so on. This is a very powerful image. So, such things in an official political system is one thing, but at the same time street politics is being promoted, having most disastrous consequences, as we have recently seen. You said that we must not allow such a mess happening on the streets; and, on the whole, it worked. Could you tell me if a police response is enough in a situation like this? DMITRY MEDVEDEV: The answer is obvious — of course, it’s not enough. Police should act quickly, effectively, sometimes toughly — and within the law. I would say that our police have demonstrated these qualities in a number of instances recently, despite a good deal of criticism the Interior Ministry’s work attracts lately. But it’s obvious that police measures alone can’t solve the problem. We need a systemic solution. Politics shouldn’t be taken to the streets. Politics should use proper channels. We may have street politics but it should stay within the limits set forth by law. It is okay to have rallies, demonstrations and picket lines but they should be properly sanctioned. There is such a thing as direct democracy, and that’s alright too. I have said more than once that we are progressing towards direct democracy. In some cases, we will re-introduce procedures that may even have been forgotten. But there should also be another aspect to politics. Parties should feel responsible for the authority they have received. Our main political force, United Russia, should not just rule; it should be smart, tactful and strong. It should promote the right people. As for corrupt officials and those who do not want to work, they should be demoted or even punished. Other parties should be invited to discuss all the issues. The fact that they are in the opposition doesn’t mean that they should be isolated from public affairs. They should speak openly about existing problems. This should also be done on television. I know that you have made efforts to have the opposition parties appear more frequently on the air and encourage them to speak the truth. OLEG DOBRODEYEV: This is unimaginable at the moment. DMITRY MEDVEDEV: They asked for it and they got it. What’s important now is that they don’t only come to federal channels but to regional channels too because in the regions there are a lot more opportunities to conceal some things and so on. I think the law worked. Yet, we can’t revel in our achievements too much. We managed to achieve something at a certain point. We’ve stabilized the situation in Russia, we reined in some very difficult social processes that were destructive and threatened to tear our country apart. That was very important. But we can’t develop on stability alone. Something has to drive us. A driving factor is the desire to do something. It’s the desire to improve yourself. If anyone thinks they are doing great in every way, they can stay in Courchevel. KONSTANTIN ERNST: Mr President, people have said that the police were not tough enough when they dispersed the Manege Square riot. Are you getting reports on the investigation into the murder that triggered the riot? DMITRY MEDVEDEV: The police acted in many different ways. Perhaps they should have been more decisive in their reaction to the very first attempts to violate order. That was obvious and that is what the police started doing later on. This means that the police cannot forget about the skills that all law enforcement officers should have, regardless of what it is called. The police have to treat suspects with tact. They have to be polite with people. They have to help people. But those who start violence – hitting people or damaging buildings – can’t be spared. They have to be punished to the full extent of their crimes. They have to understand that demonstrations of this sort will be stopped, the participants detained and, if they are found guilty, tried and put in jail. That is what we should do, there is no other way. I receive all the reports of course, including reports on the progress of criminal cases that have been opened. They were opened on various charges, not just hooliganism. All of these investigations we will see through to the end. They concern the murder of the football fan and other murders. There is one thing I have to say here. The authority – any authority be it federal, regional or municipal – has to have a fair and balanced approach to the situation. You cannot take sides. It’s wrong. We have to ensure everyone stays within the framework of law and order. If we fail to do that, we might overstrain the country, one part of it or the other part. This is what we have to remember. KONSTANTIN ERNST: But many people claim that it wasn’t so much the murder that triggered the riot, horrible as it may have been, but the fact that the suspects were immediately released. That is a violation of the principle of justice. DMITRY MEDVEDEV: I can’t object. I have issued a direct order to the investigation committee so I can’t object. I have ordered the investigation committee to open a criminal case on why the suspects were released while there was substantial evidence indicating they were the ones who committed the murder. If we discover violations, the investigators responsible will be punished. This is obvious. You can’t let a suspect go free if you have evidence that the suspect has engaged in violence, committed a murder or inflicted bodily harm. What does this tell us? Why did it happen? I spoke about this at a recent meeting. What made it happen? Was it simple corruption? Did the police get scared of mobsters in fancy cars? Why was this done? We will have to look into it. OLEG DOBRODEYEV: Returning to the subject of police. I believe people will remember 2010 as the year you started reforming that institution. Probably one of the most serious and conservative institutions of the Soviet Union and Russia. This makes me wonder. Will these reforms be limited to changing the name of the law enforcement agency from “militia” to “police” as some fear they might be? Many people don’t like the word “police” anyway. What’s your stance on that? DMITRY MEDVEDEV: I have explained this many times and will gladly do so again. Obviously, it’s not about the name. The point of the reform is to give us an efficient law enforcement structure. There are a lot of questions that people would like to ask the police and the Interior Ministry. That’s not because the people who work there are all bad. There are all sorts of people working there. Most of them risk life and limb protecting us and they do it on a daily basis. Of course there are rascals there, as in any other structure. But the point is that our police, the way they look, the way they work and the regulations on their work – all of this came from the Soviet era. We had a different society back then. There were not as many problems in the street, and not as many opportunities, the police force should correspond to the level of development of our economy and society. The legislation on the police has to be up to date. The police, I think, still have to lose some birthmarks that make it look bad. That’s why I supported the idea of amending not only the laws on the police force (which is the most important thing). The way the police force is financed will change too. Starting from 2012, all police lieutenants will receive a substantially higher salary than they do now, not to mention the higher ranks. As we are changing the backbone to provide police officers with modern equipment and normal working conditions, we have to change the image as well. As I see it, the name is part of that image. A “militia” as we understand it since the early post-revolutionary times, is a voluntary citizen’s defence force. The professional structure is called the police, in every country of the world. This should not be ideological, it is just a statement of fact. But this is not the main thing. Lawmakers are free to do what they consider the right thing. This law is under consideration right now and it should come into force early next year, the second quarter. VLADIMIR KULISTIKOV: Mr President, when you said we might return to forgotten forms of direct democracy, were you referring to the public discussion of the law on the police force? DMITRY MEDVEDEV: Not just that. It was, however, a good example. Whatever people might say, the public discussion yielded a huge number of amendments. A part of them was rejected of course, just because they affected the essence of the law. But a significant number of very important amendments were integrated into the bill. VLADIMIR KULISTIKOV: So that actually helped the work of lawmakers? DMITRY MEDVEDEV: It really helped. We ended up introducing institutions that we had no plans to introduce, including some interesting techniques used by foreign police services like giving suspects the right to a telephone call if they are arrested and so forth. Some people wrote to me: “Let’s do this.” I included it in my draft. To be honest, people had different positions on that. Not everyone wanted it to be that way but I think our society is mature enough for us to give detainees the right to make phone calls. This should not obstruct investigation of course but it is another way to ensure that rights and freedoms of a detainee are observed. VLADIMIR KULISTIKOV: What if he calls his friends in the mob? DMITRY MEDVEDEV: That’s what people said to me. They told me: the criminals will call their friends in the mafia. But listen. There is a legal term for that and if there is any reason to believe that we are dealing with organized crime and the suspect may use his phone call to contact his associates, then of course we have to stop him. If the suspect is calling home, then that’s a different matter. I am a lawyer by education. I have been in different places. I was an intern in the prosecutor’s office and I have visited police offices on various occasions and I have to tell you – our colleagues in the police have to learn to work in a different way. They can’t create sterile conditions for themselves: it’s the easiest way out to shut a person in jail and then force a testimony out of them. But we all know how that ends. The case falls apart in court. As a result, we feel like criminals have been set free. You have to have the right approach to collecting evidence. But let’s get back to democracy. Democracy isn’t just discussing draft laws. Incidentally, we are discussing a draft law on education at the moment, which is also a huge subject that concerns people as much as the police and the rule of law. What I am talking about is a broader understanding of democracy. You see, democracy today is not limited to representative democracy, when someone is elected to Parliament, for example, or a regional legislature. Modern democracy is people openly expressing their opinions. People who use digital media and the Internet know that the web often gives birth to public opinion. Now this opinion can be wrong but nevertheless it is formulated there. In some cases people are able to directly state their position. I believe that today all politicians from the president to a village head are obliged to follow public opinion and gather information via direct contact with people or digital media. That’s why I believe that when we reach a high level of record of intention, as lawyers say, then what can stop us from organising online referendums? I won’t even mention regular elections. VLADIMIR KULISTIKOV: You know those referendums, public relations and open discussions. Are they always good? Say we were talking about a construction project. We start discussing the project with the public. Russia, I think, has more “sacred places” than any other country in the world. A polluted forest may turn out to be a favourite picnicking spot. Therefore we can’t touch it. Or say there is a meadow that Pushkin once ran across. The footprints are still there. We can’t touch that either. So where do we build roads and housing? Isn’t there a risk that if we hold public debates on each and every construction project, the Chinese will build new cities, new roads and new facilities while we just sit around talking about it? In short, are you concerned at all that Medvedev’s modernisation will only exist in the sphere of discussions like Gorbachev’s Perestroika? DMITRY MEDVEDEV: You don’t like the public, do you? VLADIMIR KULISTIKOV: Oh I love them. They’re cannon fodder for our talk shows. How can I not love them? DMITRY MEDVEDEV: All right. I’ll leave that part of your question without comment. Now for the essence of your question. You know of course that public processes cannot be destructive. They have to remain within the framework of law, that much is true. But on the other hand, you know our officials. They don’t care what the public says! They can’t hear it and they don’t want to. Your example with the construction site. You must be referring to the Khimki forest. DMITRY MEDVEDEV: Or something similar. That’s exactly an example of when everyone – from the government to local authorities – could have paid a bit more attention to social trends and realised what would happen right from the start. There is nothing fatal there. And in my opinion the decision that was finally made is quite balanced. We considered the opinion of society, and at the same time we did not ruin the project; and the Khimki forest, which can be viewed as an integral whole – though experts say that it does not exist – will grow bigger in the end. We decided to plant five new trees to replace every one cut down. So in the end, everything was fine, I think. But we had to use our authority for that. I had to put a freeze on construction. And it was an extravagant decision. It will be rather good if our officials learn how to make arrangements. But it does not mean that society in a broad sense of the word should behave irresponsibly. The thing is that we realize that there are different people among the activists. Some are being paid, let’s call it, for interference with certain economic projects. I will not withhold from you that law enforcement agencies informed me that certain activists had asked for a suitcase of money to give up their stance. And I said to agree and then to catch them red-handed. We should put an end to such activity, because it’s a crime. 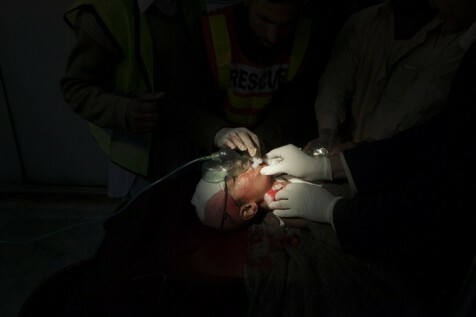 But upon the whole I think that the government and the society, the government and NGOs have to learn to work together. That’s how it happens in the world. Nobody likes when somebody puts the spanner in the works, but everyone wants to work without considering public opinion. But due to established traditions and legislation, they have learnt how to work together. And we are to learn too. KONSTANTIN ERNST: Mr President, there is a classical Latin phrase that the voice of the people is the voice of God. But at the same time the government has to make necessary economic decisions including, for example, the increase of retirement age. No matter in France or in Russia, it’s clear that a referendum on this issue would fail. People cannot realise how necessary and indispensable certain decisions are. So such a decision is inconvenient to everyone and is a concern of every citizen. 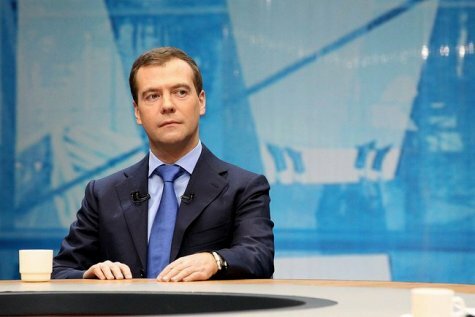 DMITRY MEDVEDEV: Only issues to be decided by a referendum can be discussed at a referendum. You don’t organise one for every issue. Moreover, you are right to say that there are unpopular decisions, which are to be made too, and public opinion is against them. In such case, we are to explain to people why we have to make such a decision, why we need to, for example, save the money. But anyway I think that bigger involvement on the part of civil society in discussing sensitive issues will do our country good. We have deeply rooted totalitarian traditions, and it will take time while we are making the utmost to get rid of them. So far, it’s too early to be worried that the society is far too active, in my opinion. Back to what you said, about bending people’s ears about modernisation, like it happened with Perestroika. I’ve read comments on that. You know, you can distort any idea regardless of the name. The main thing is that people have to want it. Why do you think there was dissonance in the 80s? We do remember it. It happened because the authorities were telling one thing, but in reality quite a different thing was happening. If there is such a gap between the authorities’ position, the president’s position, the position of the government, the decision making party and the actual processes taking place, modernisation will fail. And it will be really bad. The next modernisation, which will be made by the people, will cost us much more. It will start from a lower level; degradation will have become very serious by then. KONSTANTIN ERNST: Mr President, the fiercest debate of last year was about the situation with the Okhta Centre construction. Of course the biggest dispute took place in St Petersburg, and we took an active part in it. VLADIMIR KULISTIKOV: You do not like Gazprom. OLEG DOBRODEYEV: Whose side did you take? KONSTANTIN ERNST: The side of those against it. The situation was resolved in a favourable way, I think. 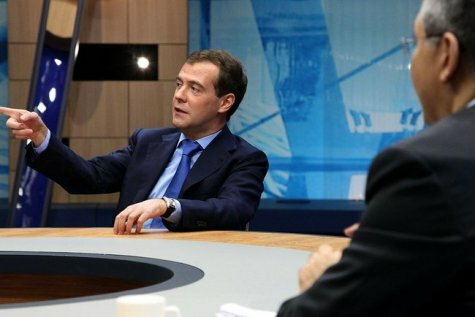 DMITRY MEDVEDEV: It’s a TV democracy. KONSTANTIN ERNST: I would like to ask you, what was your role in making this decision? DMITRY MEDVEDEV: I guess, it’s the kind of question that requires a direct answer. But, you know, I do not consider myself an expert in architecture. Some of my predecessors used artists and poets. I would not like to follow their example and use epithets so well-known to you. But when we are talking about a city like St Petersburg, and apart from being my native city, it’s the second capital of our country and a very beautiful and special place, all decisions should be very precise. In a situation when the majority of people especially when they are recognised professionals, say that the building won’t fit, unwillingly you start thinking whether it will or will not. I repeat, I am not an expert, and I did not make any decisions. It was the decision by the city administration: first to initiate the construction together with Gazprom, and then to move this piece of architecture to another place. It’s all in their power. But I had to speak up about that problem to attract more attention to it, so that the process will be performed in a more civilised way; to make the people’s voice heard. The President has a strong enough voice for that. KONSTANTIN ERNST: We’ve noticed it. Mr President, during the past year the most acute discussion was about the topic you’ve announced – fight against corruption and bribery. As a lawyer you may know the term “legislamy” [sic]. I would like to explain to my colleagues what it means. DMITRY MEDVEDEV: Please, do. Many at the screens shuddered just at the sound of it. KONSTANTIN ERNST: Legislamy is a statement that adoption of new laws cannot change the reality, the current existential situation. Does it look like legislamy? What should we do to fight corruption existing in the minds of Russians for centuries? DMITRY MEDVEDEV: It’s a topical issue. You may remember that some time ago I started talking about it, saying that Russia is ill with its disregard of legislation. It has been forming for quite a time, not at present, and not during the Soviet times, but many centuries ago. Our society was formed in such a way that it had no belief in legislation or courts. On the contrary, they believed only in the good tsar and in physical force. It’s not right. We are to do the utmost to increase the legislation’s authority, to make people observe laws not because they are afraid not to, but because it’s indecent to violate them. The system of public relations is built on this idea in all civilised societies. In this case the illness will step away. Do I have a strong medicine against it? I will tell you the truth – I do not. The therapy is to be prolonged, because you can’t fix this problem with surgical methods. We are to work hard and explain to people why it’s right to observe the law, why it’s easier than to violate it, and what’s most important, that it’s necessary that civil servants set a good example to people. Of course people see that corruption has gone through society and the state like a needle, so whatever is said, it’s regarded as idle talk, while bribes are still taken. That means that it’s not only a vaccine against breaking the law, but an example of the use of force. But what force? The force of the state. Last year we had many corruption cases. This year, about a thousand people – according to September data – if I am not mistaken, went to prison for taking bribes, 1,700 – for offering bribes. It’s often harder to catch the bribe taker. About 2,000 of them are employees of law-enforcement agencies: the police, the prosecutor’s office. There are 18 people from the judicial system, though it’s very closed, and judges enjoy very strong immunity. Nonetheless these processes are against judges as well. It’s very important because there are about 3,000 criminal cases with a high possibility of imprisonment – it’s a sign. Our people often act in a self sacrificing way thinking that others are caught and not them; when they are caught, they decide that it’s okay to stay in prison for a couple of years to provide a good living for their family. Anyway, good examples will work sooner or later. And the punishment should be very strict. We have changed a number of legislative acts, and I supported the idea to introduce a multiple size penalty for bribes. In some cases it may be a hundredfold. A bribe can be relatively small for Russia, say 30,000 rubles (around $1,000) , but the penalty of 100,000 rubles or three million is a lot of money. But the bribe’s size in this country varies. KONSTANTIN ERNST: In your opinion greed is stronger than fear in this country, isn’t it? DMITRY MEDVEDEV: Anyway we are to consider this factor. People care about their financial standing, it’s absolutely clear. It’s one thing when you are caught, spend a few months in prison and then they let you go. But it’s a different situation, when there is a sanction of this kind, when your property can be seized, or they will make you pay a penalty for the rest of your life. OLEG DOBRODEYEV: Talking about corruption. Among the most tragic events this year was the massacre of civilians in the village of Kushchevskaya, the investigation into which revealed the collusion between the police, the authorities and criminals. In fact, there were several cases around Russia where the associations between these three elements were very strong and stifled local residents. After Kushchevskaya, there was in incident in Gus-Khrustalny and then the Mayor of Engels was arrested. How can this be tackled, Mr President? DMITRY MEDVEDEV: It’s an important subject and I’m glad you brought it up. We all remember the 1990s. I wasn’t working in the government or the administration at that time. I lived in St Petersburg and many of us got the impression that very different people work in authority structures. Some of them were criminals. They infiltrated the State Duma and other institutions… I think that in the past few years we’ve managed to largely cleanse the federal authority. There is crime, yes, and there is corruption. But I believe we’ve cut off the people who were obviously criminals. The situation is different at the level of regional and municipal authorities. There are people there who still live by their own code. That’s why we need purges. Not the same purges as took place in the 1930s, but we need to cut those people off from power. Some of them are members of the ruling party. That does not mean the ruling party, or any other party, should turn a blind eye to it. On the contrary, we need to bring them out into the light – expel them from the party to strengthen the party’s authority. So, back to this issue, it’s the problem of authorities’ responsibility – both regional and local. When I started dealing with the situation in Kushchevskaya, I was struck by the fact that it was sort of dumb. Nobody knows anything, or on the contrary, we speak about it, and the law enforcement bodies do not react. Criminal cases were initiated and then dismissed. Probably depending on who comes to which room. Newspapers wrote about it, but nothing happened. In the end, governors asked me to issue an executive order so that neither governors, nor law-enforcement agencies could play back and say, ‘We heard nothing. We know nothing.’ Or it may be so that they informed the police and prosecutors, but they did not do anything. So now let them gather every month and listen to each other with a record. If you know about a situation like in Kushchevskaya, or have suspicions that there is a gang working there, write it down and let us solve the issue. And if some one did not react, we will be able to sack this person. And those who had a mercenary interest to turn a blind eye to it are to be put in prison. But the investigation is not over yet there. I am sure that apart from settling issues with criminals, we are to deal with the law enforcement agencies who worked there. It’s clear that it was not just their blindness, but corruption. And it is systematic. We will deal with it. VLADIMIR KULISTIKOV: Mr President, as far as I remember you have dwelt in detail about housing and utilities infrastructure. That’s why I am not going to ask you about it. I have another question. It’s about the Khodorkovsky’s case. DMITRY MEDVEDEV: You’ve put it in an unusual way. VLADIMIR KULISTIKOV: About Khodorkovsky. I see him as the ‘Portrait of Dorian Gray’ for our business community. Every businessman does what Khodorkovsky is accused of but Khodorkovsky alone takes the blame. He and his associate Lebedev. Do you think our judicial system may have been too hard on these people? What do you think about that as a lawyer, and as a person? DMITRY MEDVEDEV: Let me tell you what I think as the president. No government official, and this includes the president, has the right to state their position on this – or any other case – until the verdict – be it an acquittal or a guilty verdict – has been voiced. This is perfectly obvious. As for my position as a lawyer—not on this case, I emphasise, but in general—you know, lawyers and law enforcement officers operate with what is possible. If there is evidence showing that other people have committed similar crimes, where is this evidence? Where are the investigations? If there are similar crimes, the people who committed them should be held responsible because the person who committed a similar crime was punished. I’m talking about the current trial. So if this evidence exists, you should bring it to me, or to the prosecutor general, which perhaps would be more appropriate—for obvious reasons. And you should say, “This evidence proves that some major businessmen have committed some crimes. Let’s investigate it.” And if there is no response to that, then you are right, what we have here is discriminatory justice. But at this point I don’t have this evidence on my table, even though I’m not a prosecutor, I’m a guarantor of constitutional rights. But I can order the prosecutor to look at the case. If I see the evidence, I will tell the prosecutor to look into it. It’s a matter of having concrete evidence. Everything else is just speculation. It’s obvious that in any country, in any society, not all the criminals are in prison and not all of them are brought to justice. It’s all a matter of evidence. Bring me the evidence, and we’ll work with that. KONSTANTIN ERNST: Mr President, in Moscow and in general in all Russia’s big cities many people have died this year after being shot by air-guns classed as non-lethal weapons. When you see reports on TV or on the Internet, have you ever thought of abolishing them altogether? DMITRY MEDVEDEV: Of course I have been thinking about it. Moreover the processes currently underway in the State Duma regarding this were initiated by me. Almost a year ago I took care of this issue and ordered the Minister of the Interior to prepare a draft law. At the moment the document is being reviewed by the State Duma. It’s aimed at limiting the use of non-lethal weapons. They will be to a bigger extent equated to firearms, because it’s clear that you can still kill someone with a non-lethal weapon at close range. That’s why selling them should not differ much from that of other lethal weapons. There is the possibility to prohibit them. But we are to think carefully about it, because if we consider the current criminal situation, despite the well-known facts, there are more crimes involving the use of firearms, knives, and other field equipment. But those crimes are in the spotlight. People with such a weapon armed with non-lethal ammunition think they are cowboys. Thus self-defence arms turn into a weapon of assault and threat. It’s a matter of education and the rule of law. Those decisions will soon be made, but if they are not enough, we’ll prohibit their use. KONSTANTIN ERNST: In my opinion, the danger is that on the one hand, a person feels like a cowboy, on the other – feels that he cannot kill anyone, and that’s why it’s not a lethal weapon to him. DMITRY MEDVEDEV: The threshold of danger is narrow, that’s right. That’s why the proposed law says a lot about undergoing a training course before obtaining a permit for possessing this of weapon. It’s a weapon and not a pretty thing in your pocket to boast to your friends with. There are foreign versions too. Really, I can’t say if we need it in this country or not. So we’ll deal with it. DMITRY MEDVEDEV: The threshold of danger is narrow, that’s right. That’s why the proposed law says a lot about undergoing a training course before obtaining a permit for such a weapon. It’s a weapon and not a pretty thing in your pocket to show off to your friends. There are foreign versions too. Really, I can’t say if we need it in this country or not. So we’ll deal with it. DMITRY MEDVEDEV: It is my duty to do so. OLEG DOBRODEYEV: Don’t you often get a feeling of there being a power struggle among the law enforcement agencies? For instance, there are conflicts between the Investigative Committee and the Prosecutor General’s Office, and then between the Prosecutor General’s Office and the police – and it often gives an observer a bad impression. DMITRY MEDVEDEV: I’ll put it this way – there are conflicts and conflicts. Why do you think everywhere in the world, especially in large countries, it is usual to have more than just one law enforcement agency? Why should there be a number of law enforcement agencies employed to carry out relevant law enforcement functions? The answer is: in order to have them do their job properly, i.e. keep an eye on each other. This is competition, and it’s part of human nature. But it should happen within a legal framework. That’s why the Prosecutor General’s Office should be watching over the investigation agencies, and I mean all of them: the former Prosecutor-General’s investigative subdivision which is now by my order being transformed into a separate agency, and police investigation, as well as Federal Security Service investigation, and investigative bodies of other agencies. On the other hand, of course, if it all comes down to some crude score-settling, blackmailing and unjustified PR acts, like when officials try to get on camera with public accusations of the kind “we caught them, and these bastards let them go”– this is totally wrong, and the wrongdoers must be punished. Everyone must act and behave properly. But since there is a wide discussion now not only around the relations within the law enforcement branch of power, but also around the mass media, I’d like you to talk to each other as well. I’d like to ask you a question. It has also received quite a large public and media response, as I follow it up on the Internet and keep track of how the media discuss the situation. Recently, there have been some charges laid at the door of some digital media, in particular, some TV channels, of censoring information, of keeping the truth away from the audience, of having some certain rules on what to show and what not to show. That results in the fact that although we have great television shows and they are very engaging, the newscast is just miserable, as TV doesn’t show what it should, and that means there’s no freedom of speech. Do you have anything to say on the subject? VLADIMIR KULISTIKOV: I certainly do. DMITRY MEDVEDEV: You’re welcome to share. VLADIMIR KULISTIKOV: I think that on the whole the question of freedom is a very intimate question. If you ask a person whether he or she is free it’s the same as asking them whether they are happy, you know, whether they are happy in love. I believe that freedom is one’s state of mind. VLADIMIR KULISTIKOV: And so this question can be answered by any journalist individually. I, as a journalist, can tell you that I’ve always had my freedom when I worked for the media, both on television and on Radio Liberty although, you know, the Americans are quite strict and you can’t just do whatever you like. DMITRY MEDVEDEV: Can you do whatever you like at Gazprom? VLADIMIR KULISTIKOV: You certainly can, it’s a totally different environment at Gazprom. As for your question, you know, there is such a thing as editorial policy, and editorial policy can be discussed. But it’s not a question of freedom, as being creative, making TV, taking risks, going to dangerous places are things that only truly free people can do. So my opinion is that although there can be different viewpoints on the degree of freedom, freedom is definitely there as without freedom such television as we have would have been impossible. DMITRY MEDVEDEV: I see. And what do you think? 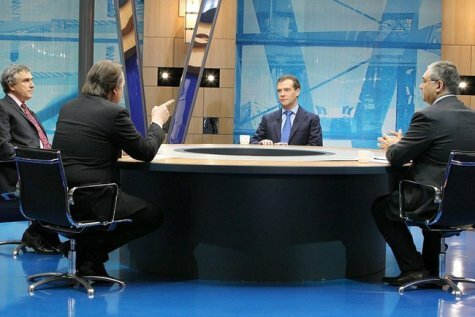 KONSTANTIN ERNST: Mr President, I think that freedom on television is limited. It is limited by the law. It is limited by moral values, by cooperation with the authorities, and by cooperation with the social structures. It is limited by people’s individual frames of thinking and views – and by people I mean not only people who like us are heads of channels, I mean all the huge numbers of people who work on channels and make television happen. I can understand the nature of such charges, but nevertheless a television free of any limits imposed by a dictatorship is free of any censorship, and in this sense I think that current Russian TV is free to the same extent as television in major democratic countries. DMITRY MEDVEDEV: I see. And what is your view? OLEG DOBRODEYEV: I think that the level of freedom always corresponds to the historical time a nation is living in. I think that these days we’re having about the highest level of freedom our television has ever had. And I know enough facts to be able to draw such conclusions. I worked on Soviet television, and in the nineties I worked for NTV channel headed today by Mr Kulistikov. I am currently the head of the key state-owned media holding company [VGTRK]. You know, just to give you an example, I remember very well the nineties, it was the time when, for instance, Mr Zyuganov – and he can confirm my words – could not get on TV for years. Another example. I am not talking now about political figures who are not widely known, but even such an outstanding public figure as Mr Solzhenitsyn – and Mrs Solzhenitsyn can confirm – he was strictly banned from television even in the most liberal times back then. And this is Solzhenitsyn. By the way, I do not wish to denounce the nineties, which is the tendency now. And I don’t want to do this because the government at that time was very much in a way sitting on a volcano with a risk of being blown up in the air at any moment. Yet, we must admit the truth. And if we are to talk about freedom, I think there are two major things here. First of all, it is about the freedom for reporters who retrieve and provide the information from hot spots, from Tskhinval to Baghdad, not only for the Russian audience but for the whole world. And that constitutes the freedom of the viewers. There is yet another important thing. Ten years ago, when Euronews came to Russia, and Russia-24 channel was launched, those were direct broadcast channels. Following your decisions, in two to three years Russia will have 20 TV channels. That’s a completely new level of freedom. That’s why I’m saying that freedom corresponds to the time we’re living in. If we talk about our time, I think that, honestly (we all read media reports and know the feedback and criticism TV is often given), many critical responses, if not all of them, are quite presumptuous, because we must remember that it’s the very hard work of many people, and I feel hurt for those who go to the hot spots, into the field, and get the crucial information for all of us. DMITRY MEDVEDEV: Since I sparked off such a discussion, I think it’s quite useful. Let me say a few words, too. You are totally right, every one of you, and yet it remains your personal viewpoint. Each person has his or her own perception of freedom, and that’s totally right. Recently I gave a speech in St Petersburg and I said that we can consider ourselves a developed democracy only if every single person can say to themselves that they are free. If we have people who think they are not free, we can’t boast of our political achievements. Freedom is really what we feel. At the same time, there are laws in each sphere of life, and there are state laws. And in this sense you all are totally right. Those laws exist everywhere, not only in Russia. Still, what should not happen, in my view, is a gap between the things that happen in real life and the newscast. Of course, assessments may differ. Some say Wikileaks is the number one event, while to others icicles in town are the major problem. Yet others say the New START Treaty is the most important thing. Channels should decide for themselves what is more or less important. Sometimes I hear people complain that channels don’t report the news right away. But this is a matter of editorial policy, of what you think is right. Still, the list of the news on TV, say, for one day, should not be strikingly different from what we read on the internet or in other media. And that’s what I think the case is today. If you don’t mind I suggest we return to the established order and you keep asking me questions, rather than the other way round, although I have more things to ask. OLEG DOBRODEYEV: Then, in order to have no gaps, as you suggested, I’d like to ask a question about Defence Minister Mr Serdyukov. DMITRY MEDVEDEV: Brace yourself, Mr Serdyukov. OLEG DOBRODEYEV: Here is the question. On the one hand, a lot has been done to upgrade the army’s technical and material condition. The spending on this was 50% higher than I the past. However, a lot things didn’t make sense and made us question the Ministry’s sanity. For example, military academies have stopped taking students. This story received a huge response. Can you comment on this? DMITRY MEDVEDEV: You know, I can comment on this, and I’ll be absolutely serious about it. I think that the ministry works hard, and as any large ministry it may make some mistakes, but on the whole it implements the policy set by the Supreme Commander-in-Chief, that is, by me. And the policy’s objective is to create an efficient army. Our army, as well as the police force, is largely based on the Soviet Union’s principles. And I’m not saying that Soviet means bad. It was a different time. It was a different country, with a different territory, and it had different tasks. We need to reform the army. Army reform involves a change in the number of personnel so as to have fewer officers on a dramatically higher payroll. We are, in essence, getting close to the level of military payroll, which is totally competitive with that of developed countries. Starting from 2012, a lieutenant’s monthly salary will be set at 50,000 rubles. And that’s just the beginning. A unit commanding officer’s salary will range from 150,000 to 180,000 rubles. This is remuneration comparable to that in the most developed armies. The same applies to housing. It’s a huge program. Let’s face the truth. Previously, the issue of housing for military personnel was ignored. Army officers have had a good salary. I recall that when I was graduating from my university some people advised me to join the army, as the salary was high, 250 rubles a month right away. And then, they said, you can make a career, and when you’re a colonel, you’ll make 500 a month. Yes, the pay was nice. But what about the housing? If you’re ordered to serve in a hot spot, you can spend the rest of your life there without a home, without anything. And we finally started to tackle this problem. Almost 100,000 residential apartments have been provided to retiring military personnel, and that’s merely for the past two years. This programme will be completed within the next two years, because a certain number of officers are still undergoing the retirement procedure upon this decision. We shall provide housing for everyone as we have agreed. Of course, some processes are quite painful. We are cutting staff, and therefore some of our capacities get reduced, too. We’ll have a smaller number of subdivisions in order to ensure higher efficiency of the army. That is why the military academies are taking a break in their operation. A huge number of officers have graduated from our military schools and academies, and there were not enough jobs for all of them. They ended up either unemployed or simply sitting around doing nothing and waiting for their term of service to end. Just recently I met with officers and asked them how things were. They said – you know, a lot of people have left, but the ones who stayed are the best people. They are the most capable, and they really love the Army and want to serve. Those who ended up in serving by accident, leave. But they are not just left hanging. They get housing, benefits, opportunities to train for another profession. That’s why we decided to make a two-year pause in this army officer training. When this period is over, we will resume admitting people into military academies. The admission numbers will be lower though, we need to base them on the size of our army. And the size of the army will depend on our objectives, our territory, and our population. KONSTANTIN ERNST: Mr President, you mentioned Wikileaks. The global media have made Wikileaks the main brand of the year. There is no doubt about that. How do you feel about it? DMITRY MEDVEDEV: Some of what’s been revealed is interesting, some things were surprising. KONSTANTINERNST: Are you afraid of Wikileaks? DMITRYMEDVEDEV: Why would I be afraid? The Department of State might be afraid but not me. Well if I was scared of what people might write about me I would never go on the Internet or watch television. A person who assumes this kind of responsibility has to understand that people don’t praise the authorities too often, and there is probably a good reason for this. The authorities have to work efficiently. No, I’m not afraid of what people might write about me. As for the consequences… the publication might have an effect on other countries’ relations, but not on our relations with the US. We all understand the general attitudes of the media and the public. We get that information from television and newspapers. Open sources. So we saw nothing new. This reminds me of a story that happened to a Soviet diplomat. He served as ambassador in a European country and had been granted an audience with the queen. After the audience he sent a cable back home saying: “The queen asked me about dissidents. I had to bring her down a peg.” That’s what happens with diplomats. They show each other how tough they are, putting labels on everybody. Every profession has its own laws. Our diplomats write to each other too. Everyone is entitled to their minute of fame, including ambassadors and diplomats. KONSTANTIN ERNST: Mr President, we have already mentioned the summer wildfires, it really was an absolute cataclysm. Last time we had anything similar to this was forty years ago. What lessons did the authorities in Russia learn from this situation? DMITRY MEDVEDEV: We learned several lessons. Firstly, no matter what happens, we need to help the people. They are just innocent victims. People suffered from this, many lost their loved ones. I think the authorities did a lot in this situation. We did what authorities in other countries don’t necessarily do. We provided housing practically for everybody, for thousands of people. And let’s be honest, this new housing is much better than what they used to have. Secondly, we paid out compensation, got the whole community involved in helping [the burned down villages]. Schools and sports facilities are being rebuilt. It is important to react quickly in these circumstances. The second lesson is how to react. And here we ran into problems. We don’t have a mechanism in place that would allow us to make speedy decisions about payments, apart from direct compensation from the budget. This practice is very different everywhere else in the world. Real estate should be insured. Insurance payments can be very sizable, even huge. And in this case the money comes not from the state budget, but from insurance and reinsurance funds. This is the civilized way of doing things. We need to start thinking about that. I gave all the instructions, and am now waiting for the Government to tell me how we will go about it. We all understand that heat is not something we can prevent. Heat can cause fires. Nonetheless, federal, regional (first and foremost, municipal) authorities have to be responsible about their duties. And this is the third lesson. If a fire starts even far way, they need to start digging trenches, so to speak. We need to create fire containment areas, primed with minerals; provide people with necessary equipment. In some cases none of this was done. People just sat around staring at the sky and waiting for the fires to get to them. This showed the poor capacity of our municipal government bodies, and to be completely honest – in some cases of regional governments as well. That’s one more lesson. And finally, the last lesson that we learned is that we need to invest in special equipment for emergency situations. Our emergency forces are very capable and well equipped, but the country is very big. Look at what happens in other places, just recently in Israel, for example, where 50 people died basically in one day. And the emergency services could not do anything until we sent our jets there. All because they simply don’t have the right emergency equipment, even though their police forces are exceptional. We need to invest in the emergency infrastructure, because Russia is a huge and very complicated country. KONSTANTIN ERNST: Will changes be made to the Forestry Code? DMITRY MEDVEDEV: Of course. I have given all necessary orders; a new draft is being prepared. VLADIMIR KULISTIKOV: Mr President, our agriculture really suffered from the recent draught. Farmers had just recovered, on some genetic level I guess, from collectivisation, surplus appropriations, they finally started coming back to normal life, and now this huge disaster. Do you think our farming will survive? DMITRY MEDVEDEV: I felt very sorry for them myself. While working in the Government Cabinet, and I was mostly involved in coordinating national projects, I began to understand the needs of our farmers. I myself am a city boy, but while working in the Cabinet I had to deal with agriculture a lot. This really helps, I would recommend it to everybody, to go through this at some point in life. To work in some area of agriculture, in one capacity or another. So we invested a lot of money, created great conditions for farmers, gave them loans. But because of this weather anomaly a third of our crops was destroyed. We gathered only 60 thousand tons. Now we need to implement the intervention plan. We just made the decision to supply over a million tons under this intervention plan. We provided financial aid for 25 thousand farming businesses, allocating a total of 35 billion rubles to them. So of course we gave support to our agriculture. But it is still very disappointing, because things had just started going so well. Sometimes when I am in a helicopter and we are flying over some Russian region, the Belgorod region, for example, I feel so proud! All those animal farms sitting next to each other, everything so clean and new, it looks great. We cannot lose this. A third of our people live in rural areas. VLADIMIR KULISTIKOV: We are not going to lose this, are we? DMITRY MEDVEDEV: We won’t. But we shouldn’t forget about it. And it is not just about weather anomalies. We can’t sit back, relax, and think that agriculture will survive on its own. Everywhere in the world the government, the state always monitors the development of its agriculture. ОLEG DOBRODEYEV: Let’s return to what will definitely be remembered – this year a record number of governors left office. The Presidents of Tatarstan, Bashkortostan, Kalmykia, and the governor of Rostov Region resigned. All these leaders had headed their regions for decades. We won’t be wrong in saying that the dismissal of Moscow mayor Yury Luzhkov got the biggest public reaction. Looking back at those events – what contributed the most to his dismissal: the vacation that he took during the summer wildfires, which greatly affected Moscow; or maybe his wife’s extensive business activities? Some time has passed since then. Can you tell us how you assess the situation now, and what played the biggest role in this important decision? DMITRY MEDVEDEV: His lack of attention to Moscow. Instead of promoting himself and playing political games, the mayor should’ve worked. Any leader in our big country, any regional head, should pay attention to his region. We all, the people who live here as well as the visitors, know and love Moscow. This city has a huge number of problems. Corruption is going through the roof, its level is very high even for such a big city with a population of over ten million. The corruption is huge. Then there are traffic problems. From time to time the city practically stops moving. And not only when the President or the Prime Minister go somewhere by car. The city infrastructure doesn’t allow for normal traffic flow. They just stuck buildings wherever they could, without careful planning. Also, business competition. This is unheard of – it’s impossible to get anywhere through fair competition. Who gets all the work contracts and tenders? Who has always won until recently? DMITRY MEDVEDEV: As the mayor of Moscow used to say, those who exhibited outstanding business skills and proved their right to work on these projects, the most talented entrepreneurs. But we know what kinds of decisions were made. It needed to be stopped. And I hope that the new mayor will act differently. He is a man of action, very capable, he doesn’t fancy himself as a star, doesn’t try to promote himself or score any political points. He has work to do, so let him work hard. These were the reasons [for this decision]. VLADIMIR KULISTIKOV: Mr President, is it difficult for you to search for new governors, new regional heads? Wouldn’t it be easier to switch back to natural selection? Hold a vote and see who beats whom at these regional elections? DMITRY MEDVEDEV: Against nature, right. We’ve just talked a lot about democracy. But not all democratic methods work well. You told me that public institutions could work against national interests. Unfortunately, so could democratic institutions. I think that the system of installing governors that we have now is the most appropriate in the current situation in our country. Why? Because our country is very complicated. It is a federation, a national federation. And let’s be honest with each other – at one point we were very close to falling apart. One of the reasons for that was the selfishness of our regional authorities. I will not give any names right now, you all know what I am talking about. So we can’t let that happen. I have already said that maybe in a hundred years’ time we will go back to direct gubernatorial elections, but I guess a hundred years was an overstatement. At this point and in the foreseeable future we need to maintain unity in governing the state, when everybody is part of the same executive chain of command: the President, the Government, and the governors. Municipal self-government bodies are a separate thing but they, too, should work in close co-operation. This should be the basis. During my presidency I replaced one third of governors, and I think it is a normal, objective practice. New people need to come. We have a lot of good, talented people. And all governors should understand that they have two, three terms at the most to prove themselves, show what they can do, how they can help people and change their lives. Secondly, people need to understand that they can’t be in office forever. At some point they need to step down and rest, letting others take their place. They also need to think about how people view them. The fact that we are using this system of installing governors doesn’t mean they should forget about people. They need to talk to the people. As for making decisions about the prolongation of terms, or dismissing governors, if I lose confidence in someone, they will have to be fired. Absolutely, no doubt here. This is not a one-off occasion. It is an institution that has to function. So if a governor doesn’t talk to people, it affects his rating. And this should be taken into consideration as well. If a governor is not popular with people, if he has a so-called anti-rating, he should not be appointed for another term. The system works. Not perfectly, but it works. And we have a lot of talented people, the party helps in this situation, because they search for people and suggest candidates. KONSTANTIN ERNST: I wanted to ask you how you felt about Japan’s reaction to your visit to the Kuril Islands. DMITRY MEDVEDEV: Well what about me? Nothing changed for me. The Japanese seem tense. OLEG DOBRODEYEV: They recalled their ambassador. DMITRY MEDVEDEV: Well, I’m sincerely sorry that I was the reason for a break in his political career. That was not what we aimed for. I am not sure what he will do now. DMITRY MEDVEDEV: I’d like to remind you that all Kuril Islands are Russian territory. The President can go there, and the only reason none of my predecessors went there is because they are so far away. But they are our territory, and we need to care about them and provide decent living conditions for people living there. I personally promised it to them. After my visit, I sent [Deputy Prime Minister] Igor Shuvalov there. He was there, and he is continuing this work. Other government officials will be visiting there too. But this doesn’t mean that we’re not willing to work with our Japanese colleagues. We are ready to implement joint economic projects. We are ready to take into consideration some historic facts concerning the Kuril Islands. We’re ready to work with them but this doesn’t mean that we should no longer regard the Kuril Islands as our land. And our partners should clearly realize that. DMITRY MEDVEDEV: We do like Japanese culture, starting with the cuisine and finishing with poetry. But I think this should make our Japanese friends happy. It makes them more popular and brings certain advantages. In my opinion, they just need to look at the Kuril issue from a different angle. Nothing brings countries closer together than joint economic projects. We could work on creating a single economic zone, a free trade zone. People will make money there. It will be a special microenvironment. People will go there to work, the Japanese will have the chance to come, visit historic sites and work there. I think this would be the correct approach. And I told my colleague Mr Naoto Kan, the Prime Minister of Japan, about this, when I invited him to visit Russia. KONSTANTIN ERNST: Mr President, human memory chooses what it wants to remember. People rarely remember what a past event looked, smelled or sounded like. But the year 2010 saw an event even I will long remember. I’m sure it was even more vivid for you. How did you find out about the crash of the Polish Air Force jet near Smolensk, and how did you react? DMITRY MEDVEDEV: It was a difficult day. I was in St Petersburg at the time. It was a Saturday and I was planning to have a break. Then my aide told me about what happened. I was shocked. It always comes as a shock, taking in news of this sort. You feel shocked and sorry for the people who were killed. And this time, it was the entire Polish political elite, as well. It happened at that spot too. It seemed eerie and hard to believe. It turned out to be true, nonetheless. Our relations with Poland have come a long way since then. Things were very complicated. I think that our relationship is less complex now. I paid an official visit to Poland. We talked. The investigation still has to be concluded of course. It can’t be politicised or serve as a reason to start blaming each other. We have to listen to all parties involved and accept the conclusions made by international agencies. Then there is the internal investigation of course. KONSTANTIN ERNST: How do you feel about Polish Prime Minister Donald Tusk calling the interstate aviation committee report ‘unacceptable’? DMITRY MEDVEDEV: I would rather think that his evaluation was emotional and the result of occurrences in Poland’s internal politics. Poland is shattered. Their communal mentality is shattered, which is understandable because it was a real tragedy. But it can’t affect our relations. And it can’t lead to the results of the interstate committee, and the investigation into the incident, being politicised. I hope that Polish politicians have the common sense and will to accept the conclusions made by the committee without any excessive political comments. KONSTANTIN ERNST: Why did the government break with a tradition that has been going since Soviet times, and admit that intelligence agents caught were working for Russia? KONSTANTIN ERNST: What agents? You know what agents I am talking about [talking to Dobrodeyev]. Were any conclusions drawn from this? [Talking to President Medvedev]? The incident made it clear to me that Russia has illegal agents. DMITRY MEDVEDEV: Anyone working for our special services is, first and foremost, a Russian citizen. They are not cannon fodder or ‘heroes’ that the state is willing to sacrifice. If the Soviet Union or, perhaps, even Russia has not talked about them before, then it was a mistake on the government’s part. Our main goal in that situation was to get our people out. We did that because, as I said, they were Russian citizens. I recently met with intelligence officers and I told them that we will continue doing the same thing in the future if anyone from the intelligence service – with or without official cover – is in trouble. These people defend our interests. VLADIMIR KULISTIKOV: And now a question for foreign intelligence services. VLADIMIRKULISTIKOV: I will be very careful. Russia’s political life is dominated by you and Mr Putin. Do you think we have any other promising politicians? If so, then probably you would like to see one as your ally, or maybe you see a serious rival in somebody else? DMITRY MEDVEDEV: I have an official announcement to make. There are such politicians in our country. You even know some of those names. I cannot but mention such distinguished people as heads of the factions of our State Duma. Indeed, they are well-known politicians, and there’s no irony in my words. These are people who have worked in Russian politics for more than a decade. There are also renowned politicians outside the State Duma. Some may say they are prominent, others may not. Well, they are famous too; such famous politicians as Mr Kasyanov, Mr Nemtsov, Mr Limonov, Mr Kasparov. They are well-known politicians. People have different attitudes towards them. They have, so to say, their own electorate. But they are also public figures. But the greatest resource is the resource we don’t talk about. These are talented people from our country. That’s where future presidents, prime ministers and deputies are now. Our country has a lot of talent. Are they telling us to wrap up? OLEG DOBRODEYEV: No, no. About the phone Steve Jobs gave you. Does it still work? DMITRY MEDVEDEV: It does, I gave it to my son. VLADIMIR KULISTIKOV: Tell us about more about your son. Has he chosen a profession? Where is he celebrating New Year? DMITRY MEDVEDEV: Well since we are talking about him and he is in the focus of attention of the heads of three federal channels… He is 15 years old and so he will be celebrating the New Year with us. And I’m very happy because I don’t get much time to spend with him. Those are very happy moments for me. As for his hobbies they are the usual things teenagers his age like: sports, books, and I hope studies. I don’t know what he will do with his life, we have some ideas but I don’t want to talk about them. This would be inappropriate because he will hear me saying this on television and do the exact opposite. So let’s let him make the decision himself. Of course New Year is a wonderful holiday, and I plan to spend this day at home like every other Russian family does. Family members think about the close ones who have to work, and toast their health. KONSTANTIN ERNST: Thank you for this in-depth conversation. We wish you a happy New Year on behalf of our audience. It would be naïve to say we hope the next year will be better. We just wish you a happy new year. DMITRY MEDVEDEV: Thank you very much. I would like to say that I wish you a happy New Year too, but I promise this: I will do it again. You know when that will happen.